Poor oral health and hygiene leads to cavities on the teeth. These cavities are basically the areas from where the tooth have started to rot because of the acids secreted by the bacteria when they digest glucose in our food. These cavities progress at a very slow pace and keep on progressing deeper and deeper until they reach the pulp of the tooth and then they cause severe pain. These cavities can be treated at a very initial stage with help of simple cosmetic tooth coloured fillings. The dentist takes about 20 minutes for a filling and then you are done! We first remove the decayed portion of the tooth with the help of a diamond bur which is rotating at a speed of 1 lakh rpm. Usually there is no sensitivity however at times it becomes necessary to numb the tooth for patient’s comfort. Then a medicinal filling is used to fill the space which is left after the removal of decayed tooth portion. What are the material which are used to fill a cavity? Silver Amalgam: Conventional material used to fill tooth. Not used much now as these fillings look unaesthetic and are dark green to black in colour. Moreover these are composed of metals like mercury tin and copper. 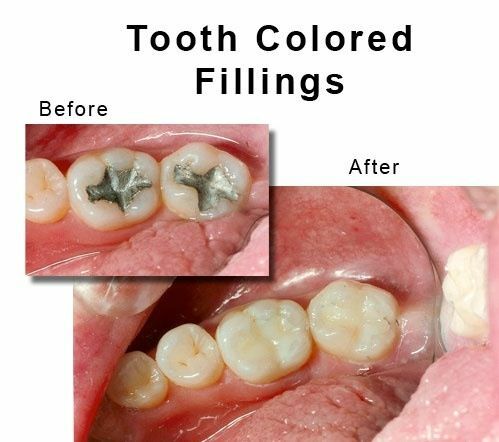 Fluoride fillings: White in colour these are used in deeper cavities and these fillings stick to the tooth. Composite fillings: these are a dentists and a patient’s best friend both in terms of shades that are available to match with the tooth and ease with which they can be manipulated to take the shape of a normal tooth. What is the cost of dental fillings in Jaipur? Cost of dental fillings ranges between Rs 700-1200,depending on the kind of material your dentist is using and more importantly the amount of time it has taken for him to finish the cavity filling. In case of large cavities he is going to charge you a bit more the amount of time and effort spent in doing that treatment.